This made me laugh so hard today. A zoo in Egypt is being accused of painting black and white stripes on a couple of donkeys and then passing them off as zebras. Hahahaha! 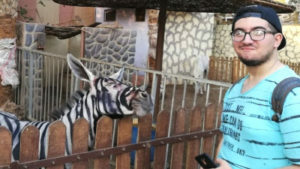 The owner of International Garden Municipal Park in Cairo denies the accusation, but one park visitor shared a photo of one of the animals with what looks like paint on its face. A veterinarian looked the photos and said the coloring of the faces is not consistent with that of a real zebra and the stripes don’t exactly look right either. The owner, however, insists the zebras are legit.